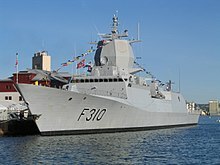 The Royal Norwegian Navy (Norwegian: Sjøforsvaret, "the naval defence (forces)") is the branch of the Norwegian Armed Forces responsible for naval operations of the state of Norway. As of 2008[update], the RNoN consists of approximately 3,700 personnel (9,450 in mobilized state, 32,000 when fully mobilized) and 70 vessels, including 5 heavy frigates, 6 submarines, 14 patrol boats, 4 minesweepers, 4 minehunters, 1 mine detection vessel, 4 support vessels and 2 training vessels. The navy also includes the Coast Guard. The Royal Norwegian Navy has a history dating back to 955. From 1509 to 1814, it formed part of the navy of Denmark-Norway, also referred to as the "Common Fleet". Since 1814, the Royal Norwegian Navy has again existed as a separate navy. In Norwegian, Royal Norwegian Navy vessels have since 1946 been given the ship prefix "KNM", short for Kongelig Norske Marine (Royal Norwegian Navy). In English, they are given the prefix "HNoMS", short for "His/Her Norwegian Majesty's Ship" ("HNMS" could be also used for the Royal Netherlands Navy, for which "HNLMS" is used instead). Coast Guard vessels are given the prefix "KV" for KystVakt (Coast Guard) in Norwegian and "NoCGV" for Norwegian Coast Guard Vessel in English. The history of Norwegian state-operated naval forces is long, and goes back to the leidang which was first established by King Håkon the Good at the Gulating in 955, although variants of the Leidang had at that time already existed for hundreds of years. During the last part of the Middle Ages the system of levying of ships, equipment and manpower for the leidang was mainly used to levying tax and existed as such into the 17th Century. During most of the union between Norway and Denmark the two countries had a common fleet. This fleet was established by King Hans in 1509 in Denmark. A large proportion of the crew and officers in this new Navy organisation were Norwegian. In 1709 there were about 15,000 personnel enrolled in the common fleet; of these 10,000 were Norwegian. When Tordenskjold carried out his famous raid at Dynekil in 1716 more than 80 percent of the sailors and 90 percent of the soldiers in his force were Norwegian. Because of this the Royal Norwegian Navy shares its history from 1509 to 1814 with the Royal Danish Navy. The modern, separate Royal Norwegian Navy was founded (restructured) on April 12, 1814 by Prince Christian Fredrik on the remnants of the Dano-Norwegian Navy. At the time of separation, the Royal Dano-Norwegian Navy was in a poor state and Norway was left with the lesser share. All officers of Danish birth were ordered to return to Denmark and the first commander of the Norwegian navy became Captain Thomas Fasting. It then consisted of 39 officers, seven brigs (one more under construction), one schooner-brig, eight gun schooners, 46 gun chalups and 51 gun barges. April 1, 1815 the RNoN's leadership was reorganized into a navy ministry, and Fasting became the first navy minister. 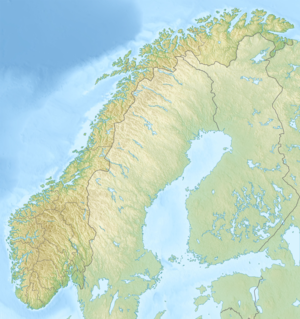 Norway retained its independent armed forces, including the navy, during the union with Sweden. During most of the union the navy was subjected to low funding, even though there were ambitious plans to expand it. In the late 19th century, the fleet was increased to defend a possible independent Norway from her Swedish neighbours. In 1900, just five years prior to the separation from Sweden, the navy, which was maintained for coastal defense, consisted of: two British-built coastal defence ships (HNoMS Harald Haarfagre and HNoMS Tordenskjold – each armored and displacing about 3,500 tons), four ironclad monitors, three unarmored gun vessels, twelve gunboats, sixteen small (sixty ton) gunboats, and a flotilla of twenty-seven torpedo boats. These were operated by 116 active duty officers (with an additional sixty reserve) and 700 petty officers and seamen. Norway was neutral during World War I, but the armed forces were mobilised to protect Norway's neutrality. The neutrality was sorely tested – the nation's merchant fleet suffered heavy casualties to German U-Boats and commerce raiders. World War II began for the Royal Norwegian Navy on April 8, 1940, when the German torpedo boat Albatross attacked the guard ship Pol III. In the opening hours of the Battle of Narvik, the old coastal defence ships ("panserskip") HNoMS Eidsvold and HNoMS Norge, both built before 1905 and hopelessly obsolete, attempted to put up a fight against the invading German warships; both were torpedoed and sunk. The German invasion fleet heading for Oslo was significantly delayed when Oscarsborg Fortress opened fire with two of its three old 28 cm guns, followed by the 15 cm guns on Kopås on the eastern side of the Drøbak strait. The artillery pieces inflicted heavy damage on the German heavy cruiser Blücher, which was subsequently sunk by torpedoes fired from Oscarsborg's land based torpedo battery. Blücher sank with over 1,000 casualties among its crew and the soldiers it carried. The German invasion fleet – believing Blücher had struck a mine – retreated south and called for air strikes on the fortress. This delay allowed King Haakon VII of Norway and the Royal family, as well as the government, to escape capture. Memorial to members of the Royal Norwegian Navy, Army and Merchant Marine in Halifax, Nova Scotia, Canada, on the flag plaza outside the Maritime Museum of the Atlantic. On June 7, 1940, thirteen vessels, five aircraft and 500 men from the Royal Norwegian Navy followed the King to the United Kingdom and continued the fight from bases there until the war ended. The number of men was steadily increased as Norwegians living abroad, civilian sailors and men escaping from Norway joined the RNoN. Funds from Nortraship were used to buy new ships, aircraft and equipment. Ten ships and 1,000 men from the Royal Norwegian Navy participated in the Normandy Invasion in 1944. During the war the navy operated 118 ships, at the end of the war it had 58 ships and 7,500 men in service. They lost 27 ships, 18 fishing boats (of the Shetland bus) and 933 men in World War II. The Royal Norwegian Navy had its own air force from 1912 to 1944. The building of a new fleet in the 1960s was made possible with substantial economic support from the United States. During the cold war, the Royal Norwegian Navy was optimized for sea denial in coastal waters, in order to make an invasion from the sea as difficult and costly as possible. With that mission in mind, the RNoN consisted of a large number of small vessels and up to 15 small diesel-electric submarines. The Royal Norwegian Navy is now replacing those vessels with a smaller number of larger and more capable vessels. The Royal Norwegian Navy Museum is dedicated to the preservation and promotion of Norway's naval history. Haakonsvern, Bergen (main base for the navy). Two of the schools of the Navy retain ship prefixes, reminiscent of Royal Navy practises. The submarine fleet consists of several Ula class submarines. NOTE: These ships are generally considered destroyers by their officers and other navies due to their size and role. Fridtjof Nansen-class frigate. Five vessels commissioned. Fridtjof Nansen (F310) Launched June 3, 2004. Commissioned April 5, 2006. Roald Amundsen (F311) Launched May 25, 2005. Commissioned May 21, 2007. Otto Sverdrup (F312) Launched April 28, 2006. Commissioned April 30, 2008. Helge Ingstad (F313) Launched November 23, 2007. Commissioned September 29, 2009. Damaged and sunk 13 November 2018. Thor Heyerdahl (F314) Launched February 11, 2009. Commissioned January 18, 2011. 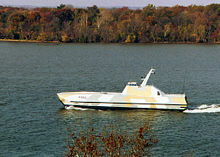 The Coastal Warfare fleet consists of Skjold class Corvettes. Storm (P961) Launched November 1, 2006. Skudd (P962) Launched April 30, 2007. Steil (P963) Launched January 15, 2008. The Valkyrien and Tyr will be replaced by the new supply ship HNoMS Maud (see below) when she commissions in 2017. HNoMS Maud, a Logistic Support Vessel, was ordered in 2013 at a cost of NOK1,320m (~US$230m). The AEGIR 18 design is based on the British Tide-class tanker from BMT, and is being built by Daewoo for delivery and service entry in 2017-18. The 26,000t vessel will allow replenishment at sea of fuel, munitions and some solid stores, as well as having hospital facilities  They have a helicopter hangar, with two hangar bays for NH-90 helicopters or future drone systems and technical facilities and workshops and supplies for carrying out heavier maintenance on helicopters than the helicopters deployed on the frigates. The KNM Maud is built with CIWS (Close In Weapon Systems) against airborne threats and Kongsberg Aerospace and DefenceSea Protector RWS (Remote Weapon Stations), a Canon, enabling kitting out the weapons suite to the operations commanded, and machine gun possitions and two riveted boarding/man overboard vessels, a canon, and ample room onboard for the protection force and transients. Enabling the vessels protection force to board vessels, using either the riveted boarding vessels or the helicopters. The addition of multiple systems for self defence and being linked up with LINK-16 also permits undertaking patrol duties when underway, or being utilised for patrol duties as a continuing role. The NH-90s enabling the vessel when at least one of the NH-90 Helicopters carrying the Frigate Kit, enabling them to take on ASuW and ASW capabilities when deployed onboard to fight threats for self defence, and thus also enabling the vessel itself to perform secondary continuous patrol duties. (The Norwegian NH-90 helicopters are delivered with frigate or coast guard kits, thus enabling the helicopters to be kitted out for ASW & ASuW (Anti Surface Warfare and Anti Submarine Warfare) or being kitted out with the Coast Guard Kit (Enabling the conversion of capabilities through kitting them out with either kit, they Can be kitted out differently within 2 house timeframe). Now that the Fridtjof Nansen class frigates and Skjold class patrol boats are in service, the next major re-equipment project for the Navy is replacing the submarine fleet. The project is currently in the final definition phase with the German manufacturer Thyssen Krupp having been selected in February 2017 to deliver four new submarines, based on the Type 212-class, starting in the mid-2020s to replace the Ula-class boats. A firm build contract with Thyssen Krupp is anticipated by 2019. ^ The Military Balance 2013 (2013 ed.). International Institute for Security Studies. 14 May 2013. pp. 160–162. ISBN 978-1857436808. ^ Helle, 1995, p. 196. ^ "The Navy – Mil.no". Archived from the original on 29 November 2014. Retrieved 14 December 2014. ^ "Den norske Marine i 1814". Retrieved 14 December 2014. ^ Keltie 1900, p. 1067. ^ Berg, Ole F. (1997). I skjærgården og på havet – Marinens krig 8. april 1940 – 8. mai 1945 (in Norwegian). Oslo: Marinens krigsveteranforening. p. 154. ISBN 82-993545-2-8. ^ "Fact sheet from Department of Defense". odin.dep.no. Archived from the original on 25 April 2006. Retrieved 27 March 2018. ^ "U.S. Studies Norwegians For Manning Mindset". aviationweek.com. Retrieved 19 March 2016. ^ "Kongsberg to Supply MINESNIPER Mk III Mine Disposal Weapon System to Royal Norwegian Navy". September 20, 2013. ^ "The Royal Norwegian Navy is acquiring Navigation Equipment Package for Combat Boat 90". November 23, 2013. ^ Ole H. Nissen-Lie (Båtliv). "Norske kjøremaskiner vekker oppsikt". VG. Retrieved 19 March 2016. ^ "Goldfish med 10 RIB-båter til forsvaret". Norsk Maritimt Forlag - Båtliv.no. 12 February 2009. Retrieved 19 March 2016. ^ Jan Einar Zachariassen. "August Nærø". skipsrevyen.no. Archived from the original on 16 March 2016. Retrieved 19 March 2016. ^ "Inngår kontrakt om nytt logistikkfartøy" (in Norwegian). Skipsrevyen. 28 June 2013. Archived from the original on 10 May 2017. Retrieved 5 April 2016. ^ "Saab receives design and integration orders for healthcare capability for Norwegian support vessel". Skipsrevyen. 7 October 2014. Retrieved 5 April 2016. ^ "Norway Looks South in Search of Arctic-Class Submarine Builder". defensenews.com. 8 August 2017. Retrieved 27 March 2018. ^ Tran, Pierre (8 August 2017). "Losing vendor in Norway sub deal hopes for another chance". defensenews.com. Retrieved 27 March 2018. Wikimedia Commons has media related to Royal Norwegian Navy. This page was last edited on 22 March 2019, at 09:08 (UTC).